My impression is that most of the newer printers use photopolymer plates. That is probably a good thing else they will end up with hundreds of cases of type as have I. I use some of it as do my students. For those of us old handspikers, it might be interesting to develop a sense and, and maybe even a census, of those who still hand set type. Chime in. dickg can report that he does hand set, Ludlow, linotype, wood type and perhaps linoleum block. I learned the lay of the case in school in 1947. Then having been away from printing for about 40 years, I was pleasantly surprised that it was back in the archives of my memory and came right back. I have a small letterpress business and set type by hand. My photopolymer work is limited to logos and decorative touches that are not available in lead. I really enjoy the process of setting type and treat my collection of 100+ typefaces with the respect they deserve. No deep impressions here. Began with letterpress in the seventies; returned to it in the early nineties. The only blocks I use are for illustrations. My printing is wholly non-commercial these days. Despite being a relatively young whipper-snapper, I do set type by hand, cut lino, engrave wood etc. Sadly, the limited space and means (coupled with a general lack of skill) leave me with a rather small selection of faces and questionable design quality. As a result, I handset my own stuff (mostly just for the fun of it) and rely on photopolymer for anything even remotely resembling commercial work. Not that I do much of the latter either. I have a fairly small but fairly good assortment of handset and a fairly small but fairly good assortment of Ludlow typefaces that more or less compliment their colder metal ‘brethren and sistren’. I’ve never used the photopolymer, but on a good day I can cut lino, wood, etc. and do so quite often as I was a printmaker before a printer —- that’s what somehow got me into the printing thing. I’m happy to I do both. As long as I get what I intended onto the paper by way of an inked, raised surface I consider it a good day. I do enjoy the meditative nature of laying out artwork by way of hand-set type and cuts, but I also enjoy the broader range of type and artwork available to me when I do photopolymer. I’ve yet to try lino- or wood- cutting but I’d like to some day. I learned hand composition from my dad (a journeyman typographer and member of the ITU) in 1976 and helped him in his on-the-side job shop (non-union) for about twelve years. He preferred Linotype and Ludlow composition, but expected me to know hand composition. I just got back into letterpress printing as a hobby after nearly 25 years and have only hand type. Ironically, I only have a few of his fonts, as most of them were sold in the mid-1990s when I had no space to store them. My collection of fonts includes about five of his, 50 or so from one of his friends’ shop and another 25 I have acquired in the past two years. I have no intention to use photopolymer, nor to print deep impression, but I do not disparage those who choose to do so. There is probably more money in photo/deep letterpress, but I am in it for the joy. Cheers to all!! I learned the basics of hand-setting from my high school journalism teacher, but when I entered the printing field in the early-1970s I learned off-set, because, as I was told, letterpress would be gone in 10 years. I didn’t have the chance to hand-set type until 10 years later I went to work at Hatch Show Print in Nashville, Tennessee. At the time the owner was selling stuff out the back door because business was so poor. He wanted to sell the business so I convinced a former owner to buy it back, and I managed the business for 3 years, cleaning, re-organizing the plant, improving the product, and re-building the client base. When I left there in 1984 I started building my own shop by collecting old types and presses, and 30 years later I have what I think is my ideal shop. In the interim I operated a poster business in 5 different locations in 3 different states, taught myself wood-engraving and bookbinding, and taught a book arts course at a university. In 2005 I sold my poster types and large presses, and since have devoted myself to printing with the iron hand-press. I currently own a small 1850s R. Hoe Washington, a Frederick Ullmer, Ltd. Albion, and a Pratt Albion, and for small items I use an Adana 8”x5”, and an Adana Horizontal Quarto. I have 9 cabinets of type, 3 galley racks with plastic cases, and 2 quarter case racks filled with types, borders, and ornaments. These contain a little over 250 fonts and over 100 different borders, and hundreds of foundry ornaments. Most of what I have is hard American and European foundry type, but I do keep a bit of Monotype for certain faces not otherwise available. I have no real need to use photopolymer, and would rather support the last type foundries before they disappear. I have used wood-engraving, woodcuts, and linoleum cuts to extra-illustrate my work for years, and prefer their use over plastic plates. Occasionally I will use a zinc or magnesium plate, but prefer to keep everything in-house. Deep impression has no place in my shop. I value my types and equipment far tor much to abuse them, and I have little respect for printers that let their customers dictate how their equipment is used. My type holdings span nearly 150 years, and I care too much for my types, my tools, and the craft I have spent decades learning, to cater to an idiotic fad. With care my types, and most assuredly my presses will last for a few more generations. Since letterpress as an industry is in its last throes, I would like my tools, many which are no longer replaceable, to out-live me, and be used (not abused) and appreciated by a few succeeding generations after I’m gone. I mostly hand set type, which reflects the second motto of our press “We print small things in small quantities.” I do use the occasional polymer plate for illustrations or larger type that I don’t own. Learned the case lay(s) back in the mid-1960s with my father and brother and have never lost the feel for it. Did manage to learn a couple of foreign case lay(s) , but I still need a cheat sheet for some of them. Strictly private printing these days. My hand setting days go back to 1953/4 when I purchased my first press and type from Kelsey. The men working in the Army print shop where I lived at Ft. Belvoir, Virginia spent a lot of time with me as a kid showing me the ropes. From there I have spent the following 60 years putting together my shop. With about 500 cases of type, working linotype, Ludlow and a Monotype caster, I have almost all the bases covered. I have the bigger presses, like a Heidelberg platen, Miehle Vertical and my best printing friend, a 10x15 C&P, now in my possession for about 57 years. My new shop is nearing completion and with the second floor, I’ll have almost 2,000 square feet for all my stuff. I make photopolymer plates commercially but not for my own use. I still prefer hand setting type, though the linotype beckons with its newly installed Star quadder. My mat collection numbers in the tens of thousands of matrices—I had one fellow arrive in town with his father’s collection of mats that numbered maybe 15,000 in all, and his asking price was $50. Another cabinet with 7000 mats came my way at 2 cents a mat, and it all adds up. But no more cast iron—I can’t possibly use even a fraction of the letterpress material I have with the time left on my limited warranty. Paul’s self-taught wood engraving is quite spectacular, and he has a nifty wood ruling machine to boot. Inky, just two days ago I ordered my first polymere plates to expose on my poly machine that I have owned for over 20 years and use it to make my signature rubber stamps. Everything I print I use either linotype or Ludlow, recently I added 50 cases of hand type, one rack of 25 cases came from my friends shop in Boston, his mother used to set type from this rack, the old comps used to put two fonts in nearly every case, this one has this, a large type with a smaller type so you can tell them apart. I have only a dozen or so magazines for the linotype but I’ve been collecting Ludlow mats since the 1970s, now have 18 cabinets of mats and over 100 fonts on gallies. I have always set type and will continue until the big guy upstairs has other plans for me. My print shop is exclusively hand-set metal and wood type. I enjoy it very much. Recently, I’ve begun learning wood carving, with hopes of providing occasional illustration for poetry broadsides and chapbooks. Nice to hear what others are doing. Thanks for the discussion. But most of the fine presses over the past 100 years have used some impression when printing books from handset type. While I agree that deep impression is wrong, isn’t printing with some light impression a proper use of type? Ad Lib Press happened because I had an opportunity 50 years ago to buy a 10x15 platen jobber for $10. It has been all hand-set type and a few photoengravings I have bought for illustrations and logos, as well as old ones scrounged. I’ve scaled back from the max and now have just four presses and 35 cases of metal type plus half a dozen fonts of wood. I prefer handsetting what I will print and decorating it with whatever cuts I have in the collection — though I do get new ones occasionally for projects like my “printing press trading cards”. Good responses. Thank you. More to come I hope. Some good stories in there. In response to Bill’s question. If you don’t have some impression you can’t print letterpress, even offset relies on some impression. The problem I have is when I see 6 point type receiving the same amount of impression that it takes to print 72 point Cooper Black. I cringe when I see impression so hard that the surface of the paper cracks in the corners, or the paper is so distorted that it no longer lays flat. It is nothing but lazy printing, and ignores all of the rules for makeready. Shoot, if you give it enough impression you can do away with makeready entirely. Like my mentor Kenneth Hinson said, “The impression should only go half-way through the paper.” Every time I ever handed a piece of my printing to a printer who had been taught properly in the trade, the first thing they would do is turn the sheet over to examine the impression. If there was more than the hint of dimpling on the back I was sure to get a lecture. I always passed that test. How many letterpress aficionados would do so today? I assume that the fine presses you mention were printing upon dampened paper. That is a different matter than printing on hard wood-based papers. When an all-rag paper is dampened, inked type can penetrate deeper in to the paper without the same kind of damage - although this, too, can be taken to extremes. I have examples of some of the finest printing of the last century in my library. 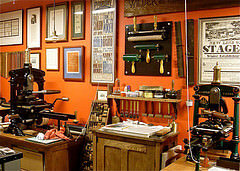 Why wouldn’t a letterpress printer today wish to emulate the best printing of the past? Devils Tail Press, I think you have provided the answer to my question. The maximum letterpress impression using hand set type is “half-way through the paper”? The point being that it is not pushed all the way through the paper. I have never advocated no impression, but I do recommend the necessary amount impression, and no more. Paul, I wonder how many of todays printers would even know about looking across the back of the sheet. In school when we were to run a job on the press and had the makeready all done, we were required to take a press proof to the teacher. The first thing he did was turn the sheet over. We knew not to present it if you could see or feel the printing on the back. He knew that we knew and that he had done his teaching well. Having shown the old school from which I come, I will admit that the artist today should be able to do as she sees fit. If she wishes to do smash printing, that is OK.
Just not with my type…. I’ll not recommend using the half the way rule when printing with metal types on a 900gsm stock :-) I try to handset as many jobs as possible – because that’s the thing I can do. When my clients are asking for deep impression from handset types I find it easy to explain that it isn’t possible, because a lot of my types are very rare and old and shall stand in use for the next generation too. No problem. If they want a bit more impression or have a specific design we’ll have a plate polymer made. No problem. When speaking about the depth of the impression (many clients want as much as possible because it is soooooo beautiful). Often we have a face to face meeting where I’m using a lot of time to explain the issue with the backside. I have in my reference collection a few very badly pieces of deep impression prints that I’m showing them. None of my clients wants ugly backsides when they first are aware about them. No problem. If some people still wants the extra deep impression I tell him/her that my very old, very rare and antique presses unfortunately aren’t designed for that type of printing and he/she has to find another place. No problem for me. I do understand why many private people or graphic designers want the deep impression – they want a contrast to the digital world they want to feel the print. The challenge here is to satisfy that need and at the same time keep the good craftsmanship alive. The responsibility for that lies on the shoulder of the good letterpress printer. I just tell them I’d rather cut off both of my hands, and poke out my eyes than print like that. It sends ‘em scurrying to the door. In my accumulation, I have many cases of 6 and 8 point type. Maybe the 8 point has some application, but I cannot see the 6 point well enough to set it. This even if I thought it might have some application. I do also have a dozen or so pieces of 4 point type. The only application this might have had was for the disclaimer on the back side of a parking garage ticket. Can you imagine getting the kiss inking just right so as not to plug the counters of the 4 point type. I have only used hand set type so far. I am in the process of getting a linotype moved and up and running so that may change soon but I suspect I will always enjoy the process of composing a stick of type and how it makes me feel connected to the history of printing. Im hoping when Im gone they will still be around being loved by someone else, unlike a polymer plate maybe. pixieguk, nice job, I like looking at hand cut things, Paul from The Devils Tail Press does some remarkable things. Good to see so many young kids still setting type by hand, for a while I thought it would disappear for good.